Epilepsy is a chronic condition produced by temporary changes in the electrical function of the brain, causing seizures, which can affect awareness, movement, or sensation. Seizures occur when clusters of nerve cells in the brain, called neurons, signal or communicate with each other abnormally. 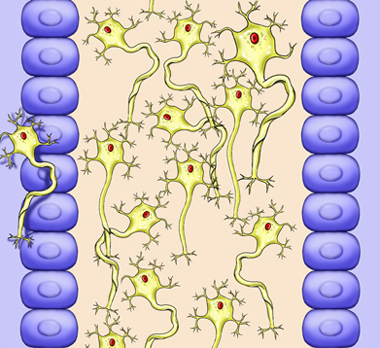 During a seizure, the neurons' normal pattern of activity is disturbed. It causes them to fire as many as 500 times per second instead of the normal rate of about 80 times per second. This can cause strange sensations, emotions, and behavior, or convulsions, muscle spasms, and/or loss of consciousness. A diagnosis of epilepsy is usually not made until a person has a seizure more than once without a preventable cause. In many cases, the exact cause of epilepsy is not known. What are the risk factors for epilepsy?What are the symptoms of epilepsy?How is epilepsy diagnosed?What are the treatments for epilepsy?How can I reduce my risk of epilepsy?What questions should I ask my doctor?What is it like to live with epilepsy?Where can I get more information about epilepsy? Epilepsy in adults. EBSCO DynaMed Plus website. Available at: http://www.dynamed.com/topics/dmp~AN~T115086/Epilepsy-in-adults. Updated December 8, 2016. Accessed February 6, 2017. Epilepsy in children. EBSCO DynaMed Plus website. Available at: http://www.dynamed.com/topics/dmp~AN~T900174/Epilepsy-in-children. Updated December 8, 2016. Accessed February 6, 2017. Epilepsy information page. National Institute of Neurological Disorders and Stroke website. Available at: https://www.ninds.nih.gov/Disorders/All-Disorders/Epilepsy-Information-Page. Accessed February 6, 2017. Lowenstein DH. Seizures and epilepsy. In: Longo DL, Fauci AS, et al, eds. Harrison's Principles of Internal Medicine. 18th ed. New York, NY: McGraw-Hill; 2012. Seizure disorders. Merck Manual Professional Version website. Available at: http://www.merckmanuals.com/professional/neurologic-disorders/seizure-disorders/seizure-disorders. Updated June 2016. Accessed February 6, 2017. What is epilepsy? Epilepsy Foundation website. Available at: http://www.epilepsy.com/learn/epilepsy-101/what-epilepsy. Accessed February 6, 2017.